When we think of America’s aging population, we have to consider that baby boomers hit retirement age at a staggering rate of 10,000 people every single day in the United States. The National Center for Biotechnology Information (NCBI) reports the number of Americans over the age of 65 is projected to more than double in the next 40 years, increasing from 40.2 million in 2010 to 88.5 million in 2050. Scientists and researchers are trying to understand the cognitive changes that accompany aging in relation to physical and mental exercise. Finding ways to maintain your body's mobility through exercise and mental stimulation will be key to your health. 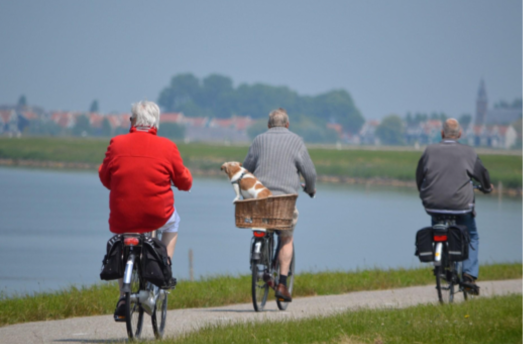 Finding ways to keep your body active in your later years may prove challenging. However, one option is to try practicing yoga. Yoga builds muscle over time by using your own body as resistance. Consider it also enhances flexibility, eases aches and pains, boosts your mood and improves balance, as well as providing a host of other benefits. If you're not sure you want to first try yoga in public, YouTube has an endless supply of free videos you can try from the privacy of your home. Maybe you can get back on your bicycle, as it too is low-impact. Perhaps you'd rather take up dog walking as a means for exercise; its low impact, offers fresh air and quality time outside and provides therapeutic benefits for our four-legged friends. Some of the benefits include helping keep your pet healthy, manage weight control, curb destructive or hyperactive behavior, and strengthen your bond. The best part: You can walk dogs on your own time. Cognitive activities for the elderly will help keep their minds sharp and alert while also reducing the risk of age-related dementia. Cognitive skills are the mental capabilities a person has which allow them to process all the information they receive from their five senses. These skills are necessary to help an aging person think, talk, learn new things, read and recall memories, and draw conclusions. There are some everyday activities that can help stimulate and enhance cognitive skills. Try your hand at watercolor painting or pick up pastels. They're both mediums that are easy to manipulate and activities that can be done with relatively little prep time. Playing games and working on puzzles are great activities to stimulate your brain. Hobbies are a great way to stay mentally active and offer a relatively low impact on the body. Social capital is a term that focuses on the social relations between people and offers productive benefits through valuable social networks, through bonding or linking of similar people. “The relationship between social capital and health gains has been well established in the gerontological literature,” offers Tannistha Samanta in her piece on Critical Gerontology, “in particular indicators of social capital such as trust, networks, neighborhood cohesion and norms of reciprocity have been shown to be associated with longer life expectancies, reduced rates of non-communicable diseases, and a reduction in depression and substance abuse problems among older adults.” Whether you're engaged with other folks in your social settings or on social media, it is imperative to remain social. An engaged senior may have the key to a healthy, long lifestyle. By embracing low-impact exercises such as practicing yoga and dog walking to stimulating cognitive activity through hands-on activities and mental challenges, you can increase your chances of enjoying this part of your life. Author: The article above has been provided by Karen Weeks of Elder Wellness.